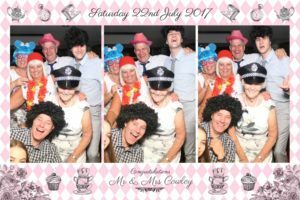 On Saturday 22nd July 2017 we took the Star Eventz Magic Mirror Booth to Lincolnshire for the wonderful wedding of Mr and Mrs Cowley at the White Swan Hotel. The White Swan is a small hotel and restaurant nestled between the historic City of Lincoln and the Humber Estuary which boats some fantastic and tranquil views of the River Eau. Their theme was vintage mad hatter (without any Alice in Wonderland characters!) and with this information we set out to create a magic mirror photo booth template to would fit the occasion and theme. When chris first contacted us back in March he explained that he was looking at doing something a little different and that he had seen our Magic Mirror on social media and was interested to know how it worked and how it would fit into his special day. 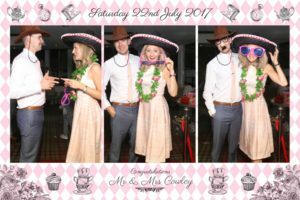 We were in the early days of the Star Eventz venture and were very keen to make the right impression especially as we loved the sound of the Cowley’s Mad Hatter themed wedding. 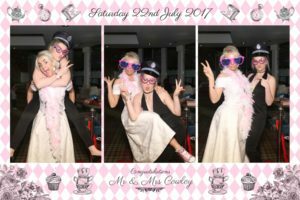 We were delighted when they confirmed with us that they would like us to attend their wedding with the magic mirror photo booth. Chris also mentioned that he wanted his guests to feel special at his wedding and asked for red carpet and rails to be included in his package along with a wedding guest book which includes another copy of all of the photos taken from the Magic Mirror whilst at the wedding. The reception went very well and the Magic Mirror was well received by everyone. Both bride and groom looked stunning as did all their guests. village was the furthest location that we have taken the Mirror and was a beautiful setting for a wedding. helped ensure the smooth running of the event. We took extra care to organise the Magic Mirror set up in a way that encouraged less waiting times for guests waiting to use the Mirror, with a spacious printing area on exit so that guests had space to collect their photos once finished without queuing guests having to wait for them to finish. This also meant that the host got his finished signed Guest book at the end of the night, adding to the complete photo booth experience that we strive to achieve for everyone. It also allowed us to interact with the customers more and help guests take great photos and show them the props. again throughout the evening to get another photo or show their friends and family. We even had a few enquiries at the end of the night by people wanting us to bring the Magic Mirror to their own impending events in the near future. All in all another very successful event accomplished and thanks to Mr and Mrs Cowley for having us at their wedding and choosing Star Eventz. We wish you a fantastic honeymoon and many happy years in the future.